Recently, the Stonehenge has been in the news as the archeologist community is coming up with some new and interesting new theories. Armed with recently acquired technology, these archeologists try to find how accurate their theories are. Colossal rocks arranged in a circular pattern, Stonehenge is one of the oldest monument that has kept archeologist around the world scratching their heads. There are multiple theories surrounding this phenomenal structure, but none have been confirmed until recently. Speaking in an archeological lingo, Stonehenge is “prehistoric glockenspiel” , these rocks are Bluestones. A hard Dolerite that’s been found all over the Britain. Most of these bottles came from Neolithic quarries in Wales. Countless gems are regularly found near these stones, one more intriguing than the other. Recently, a 4000 years old dagger was found in the tomb near the Stonehenge. This dagger had 100, 000 golden studs embedded in the handle. These studs were delicately carved and were very thin. Although these studs were thinner than the human hair , they are as dense as 1000 microscopic studs. Were These People Avid Engineers? Expert geologists have acquired strong evidence that the people had deep knowledge about physics. Geologists have found various engineering tools, equipment, and experiments that point that was enough evidence of platforms, ramps, food, and fires. This evidence was found in North Pembrokeshire, Wales about 180 miles away. Not literally, though! The archeologists have recently developed a very intriguing theory. 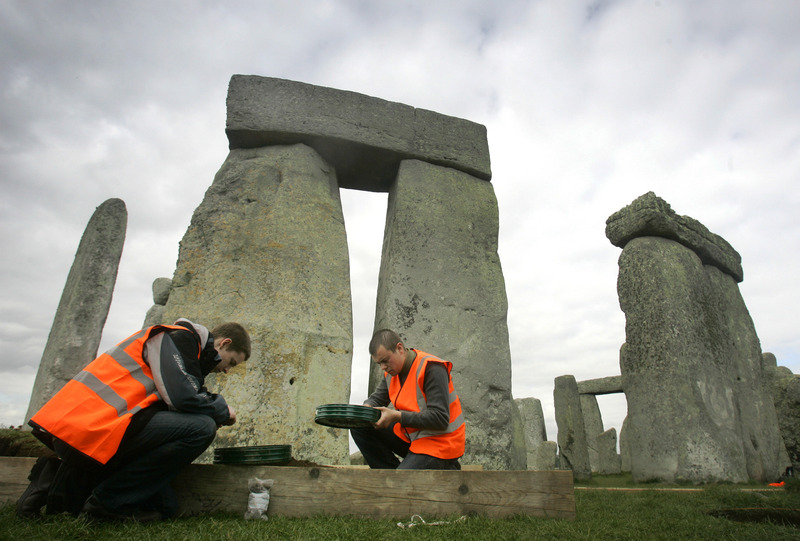 If these archaeologists are right, the mystery of Stonehenge is that much more incredible. After all, it’s no small feat to get 80 monoliths across 180 miles using only Neolithic technology. It is said that these colossal rocks were brought here from at least 180 miles away from the site. It was an incredible feat to get 80 monoliths, weighing more than 25 tons each, across 180 miles using only Neolithic technology. A place which was seemingly the “loading bay” was found by the researchers. This place had a lot of stones along with burnt hazelnuts and charcoal. Radiocarbon dating on the hazelnuts suggests that them around 3400 BC. When Geologists found evidence of a loading bay, platforms and ramps, they concluded that the team dragged the stones using ropes, levers and sheer manpower. 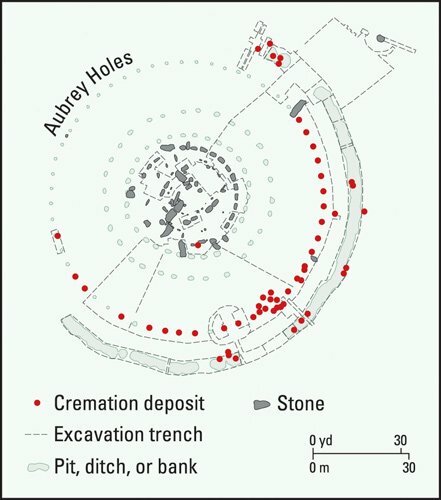 50000 bone fragments were found buried near Stonehenge, which was most probably remains from cremation rituals. When Professor Mike Parker Pearson excavated and studied the site for the very first time, they found that the burials predated the monuments. The smaller bluestones were brought from Wales and were used as grave markers around 3,000 BC. These stones remained as a graveyard for at least 200 years. The theory of these stones being some sort of music instrument may be the most absurd theory you might have heard. Music instrument to whom? Who would play music on these colossal rocks? Giants? Aliens? Well, generating music from rocks might not be that far-fetched. Recent research led by sound specialist Jon Wozencroft and archaeo-acoustic expert Paul Devereux from the Royal College Of Art has a unique perspective when it comes to Stonehenge. Stones of these site are lithophones aka rocks that produce musical notes when struck.In fact, people of Maenclochog (a Welsh village) used these types of stones as church bells till the early 1700s. A special project called the “Landscape and Perception Project” was initiated which was directed using the sensory material, replicating our Stone Age ancestors. So, there you have it. These are some of the theories surrounding Stonehenge, each more mysterious than other. Do these theories make any sense to you? Let us know what you feel in the comments down below. We love your feedback, no matter how controversial that may sound.